A modern take on Art Deco style, the Bronze Armchair VI will add elegance to a reception room or living room. The gentleman's club feel with bronze base and metallic edging will sit well with dark wood finishes in the form of a distinguished bar cabinet and crafted coffee table. Deep, dark colours will bring out the exquisite detailing, however, the strong design details will hold their own in a more contemporary setting. 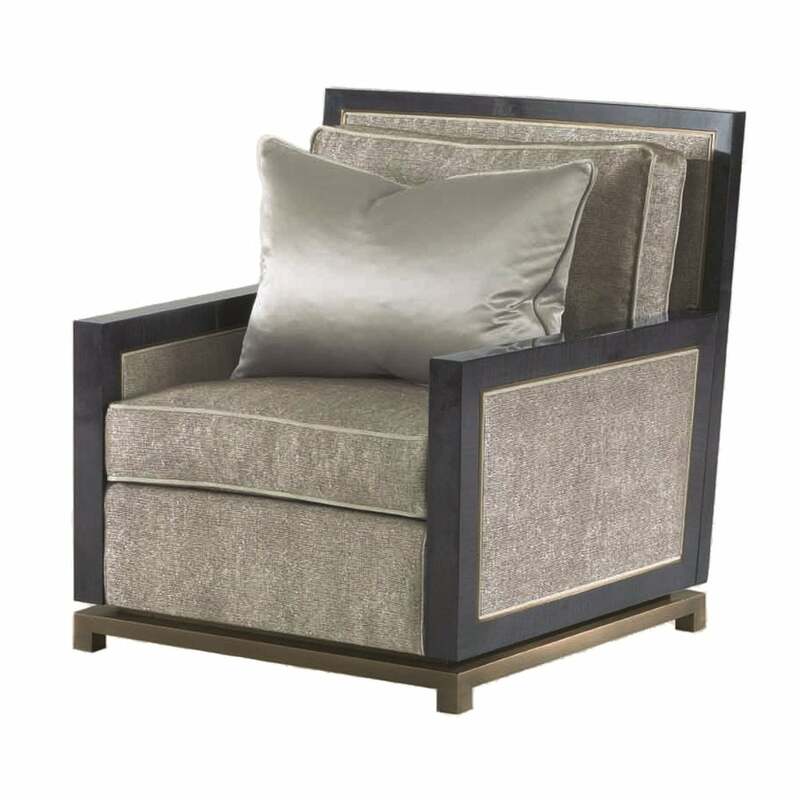 Luxurious fabric and the finest materials in Italy give this statement armchair a timeless quality. The understated and sophisticated style of Kamini's look create the Bronze Collection of Furniture by Orsi, marrying exclusivity with considered design. Shown here with straight arms, the sister version features a sloped design. Priced in the brands own luxurious fabric, this armchair is also available in a material of your choosing from our extensive fabric library. Priced for Natural Black American Walnut in high gloss finish + bronze or Figured Sycamore stained dark grey in high gloss finish, bronze trimming detail inside/outside back and arms, bronze base; seat and back cushion padded with a core foam with feather wrapped all around with Rubelli ‘SuperWong’ fabric range, colour Grafite with piping in Rubelli ‘Wong’ fabric range, colour Argento. One decorative loose cushion cm. 68wx45h upholstered and piped in Rubelli ‘Wong’ fabric range, colour Argento.